Projekt „W“ (the „W“ stands for „Weltherrscher“ which is german for „World ruler“) is my current project and up until now also my most ambitious and complex project. First ideas for this game came up in 2003 and I quickly put together a first prototype. But I didn’t really like the game design back then as I felt it was too bloated and boring, so I did put the project to rest. 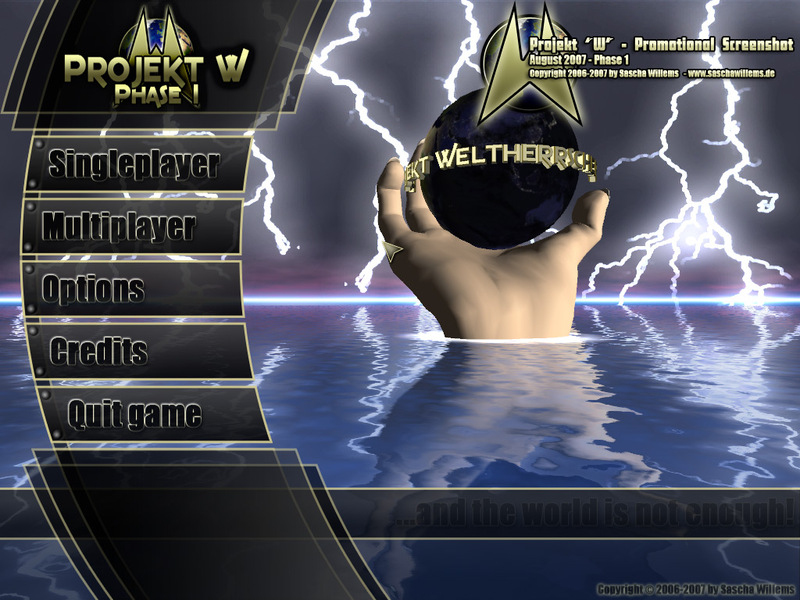 But then back in agust 2006 I decided to pick up the idea and totally rewrote the game design in order to make it quicker to play an more appealing.Since then I spent a lot of time working on Projekt „W“ and with the release of „Phase 1“ most of my initial game vision has come to life. Also note that this is a freeware game, so you can download and play it without having to pay or unlock anything. If you see a page where it’s offered as a paid download please inform me and refrain getting it from there. As with all my recent projects this one has also been coded using Borland’s Delphi, it uses OpenGL for 3D graphics (and even shaders when supported) and FMOD for audio output. 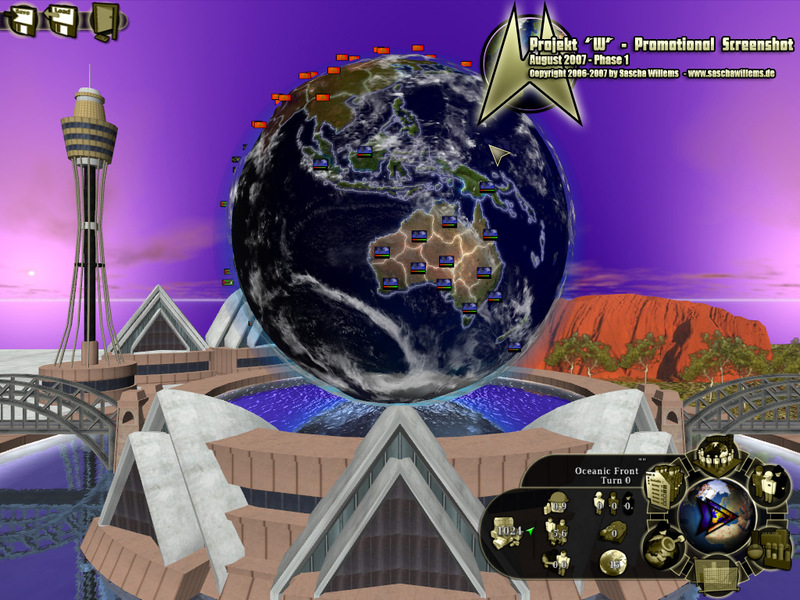 Contrary to most turn-based games it’s visuals are on-par with modern game, including a detailled 3D-globe, unique 3D-backgrounds for each nations, reflecting shader-driven water and a day/night-cycle with night-lights for the globe. Since “Phase 1” has been released I started working on “Phase 2”, that’ll contain a lot of new features (see below). You can take a look at the roadmap for “Phase 2” here. It includes all the major changes for “Phase 2” and is updated regularly. Note : The above full package is always up-to-date. If you download it you usually won’t have to install these patches! 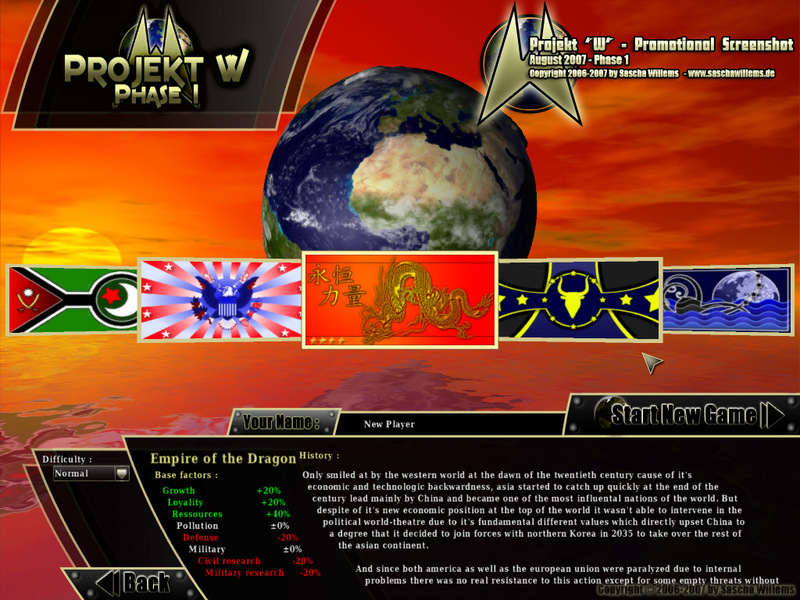 Phase 2 will be the “successor” to Projekt Weltherrscher (known as “Phase 1”). It’ll include some features that didn’t make the cut for the initial release as well as many new features, new content, new functionality, redone user interface and much more. The game is set in a fictional history roughly around 50 years in the future and only five huge nations exist in this setting, each with it’s own extensive history, flag and territorial belongings. It’s basically a spin on the current hostile world-political situation and shows how this (in my opinion) could turn to in the worst-case. All known structures that tied the nations together, like the United Nations, the NATO or the G8 have broken apart and the nations even started to separate them in terms of economy. So there are no more ties between those new nations and it’s a survival of the fittest, so in the end only one nation will stand victorious. Your regions are your most valuable possesion in this game. If you loose them all you loose the game and they’re the only way to produce ressources that are needed to „buy“ things in the game. Each region has different factors that you need to take care of and to alter those factors you need to construct buildings. There are dozens of buildings that can be construced with the most advanced buildings needing to be researched. This way you’ll always have some obsolete buildings to replace. Since this is a very hostile setting, paying attention to your army management is crucial. You’ll have to construct military units (infantry, tanks, aircrafts and more) and put them into divisions that you assign to your regions. Those divisions then can be used to overtake enemy regions and to defend your own regions. 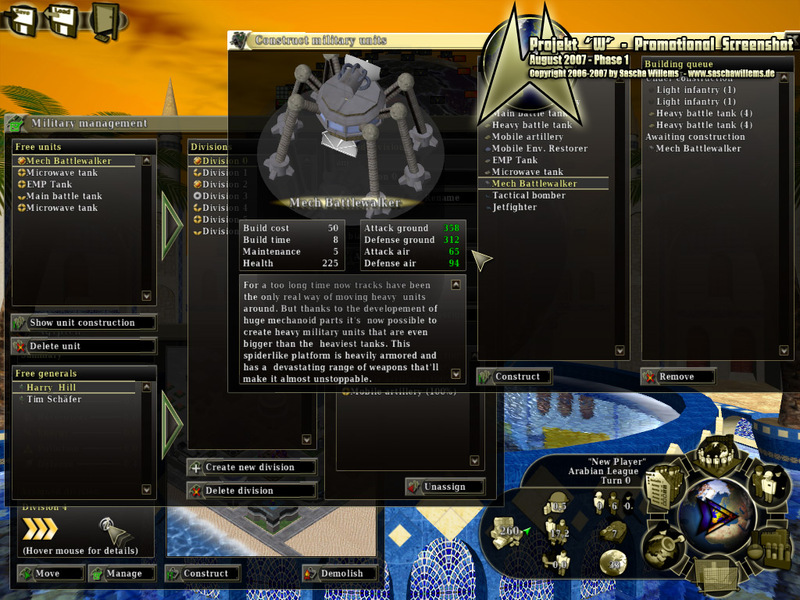 As with the buildings you’ll also be able to unlock more powerful military units by researching the appropriate technologies. A lot of buildings, military units and even global benefits can only be reached by researching new technologies. So it’s always wise to hire some scientists, construct some research buildings and do research in order to have an edge over your enemy. Although a passive feature it’s a very important part of the gameplay. 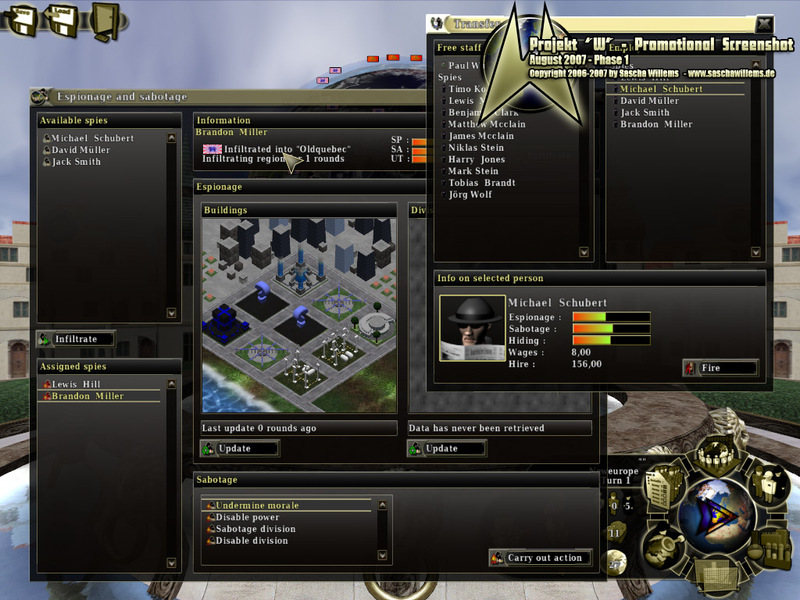 You can hire spies and infiltrate enemy regions in order to spy important date (like constructed buildings or stationed army divisions) and even do some sabotaging acts that can give you the needed advantage before attacking an enemy region. 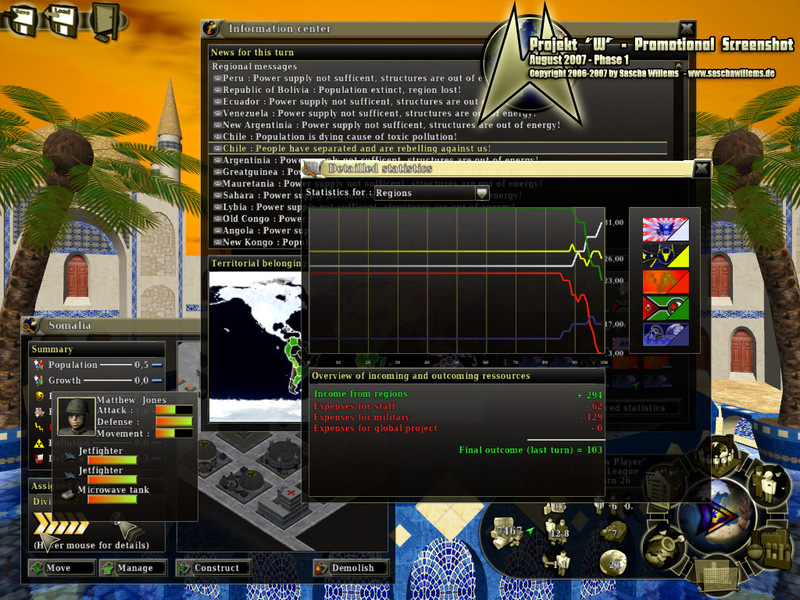 But be careful, it’s possible that your expensive spies get captured when doing espionage and sabotage acts! 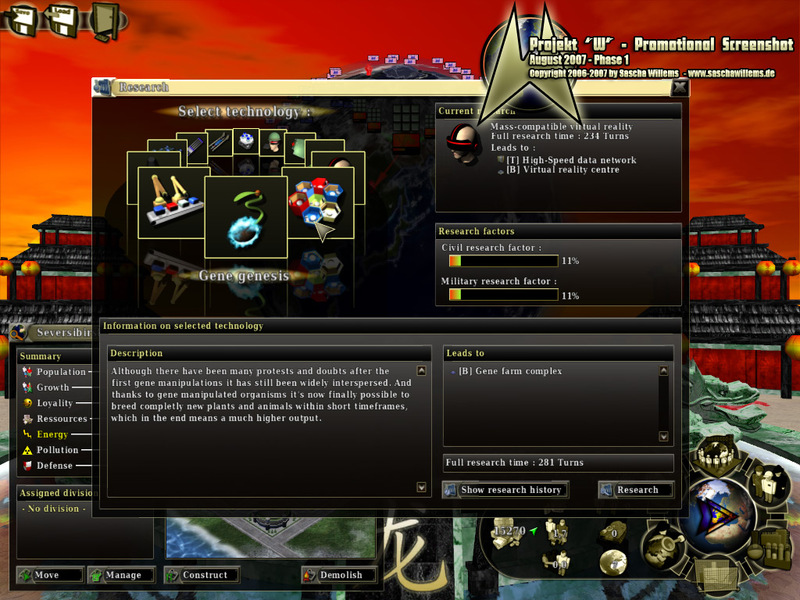 You can hire scientists that boost your research, spies that help you get important informations and generals that can be assigned to divisions in order to boost defense and attack values of your military units. It’s very important to have an eye on your ressources. You need them to buy military units, to construct buildings and to hire stuff, so if you spend more ressources than you earn you won’t be able to expand. 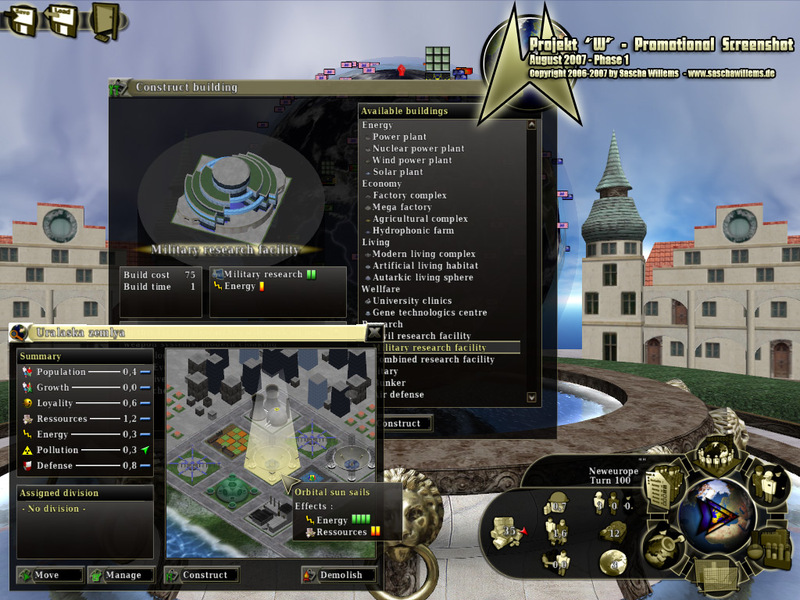 So spend them wise as only regions produce them and military units and hired staff will cost you ressources each turn. 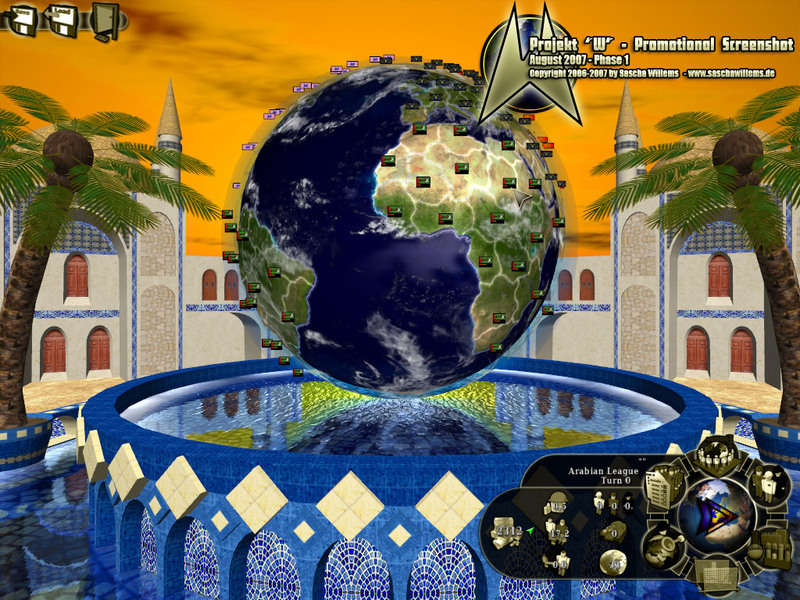 The game can be played alone and with multiple human players. 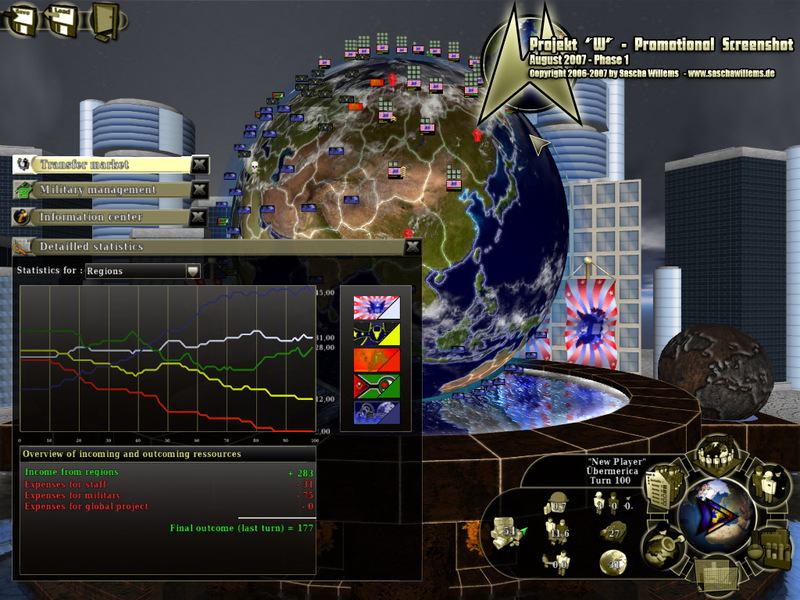 If you decide to play alone you’ll choose your nation and the difficulty and all other nations will be controlled by the computer and you have as much time as you like to make your turns. Note that this is the first complex computer controlled intelligence I ever wrote so it’s not the smartest one around. 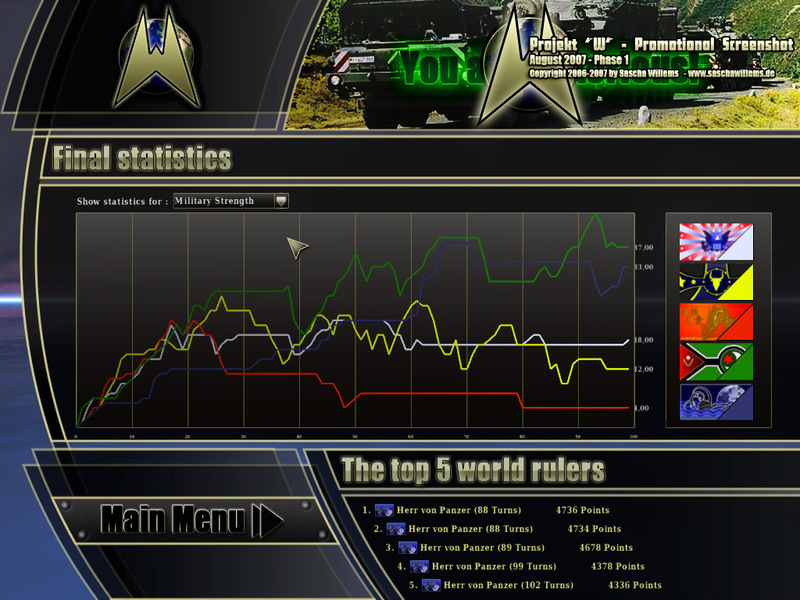 And if you’d like to play against human opponents then the hotseat-mode is the way to go. 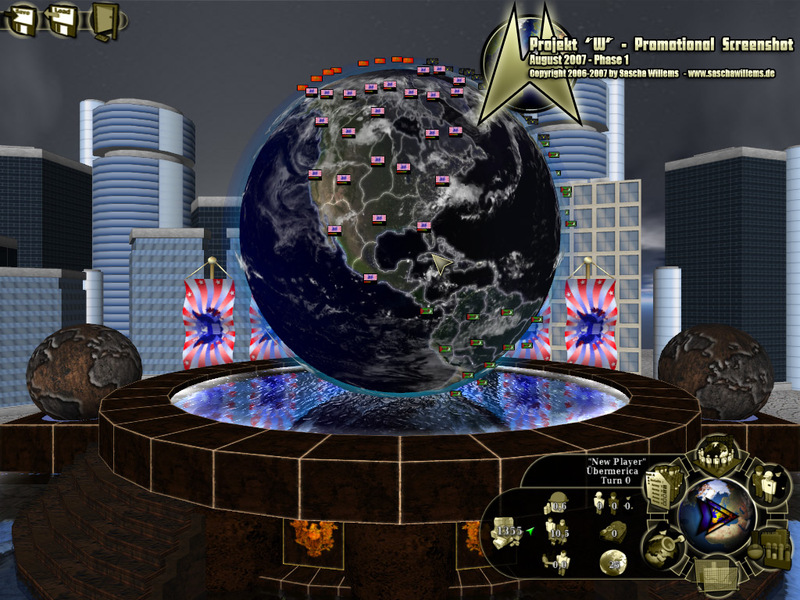 It allows you to select if a human or the AI controlls a nation so you can play with up to five human players. If a player is finished with his turn the next player will take over mouse and keyboard. 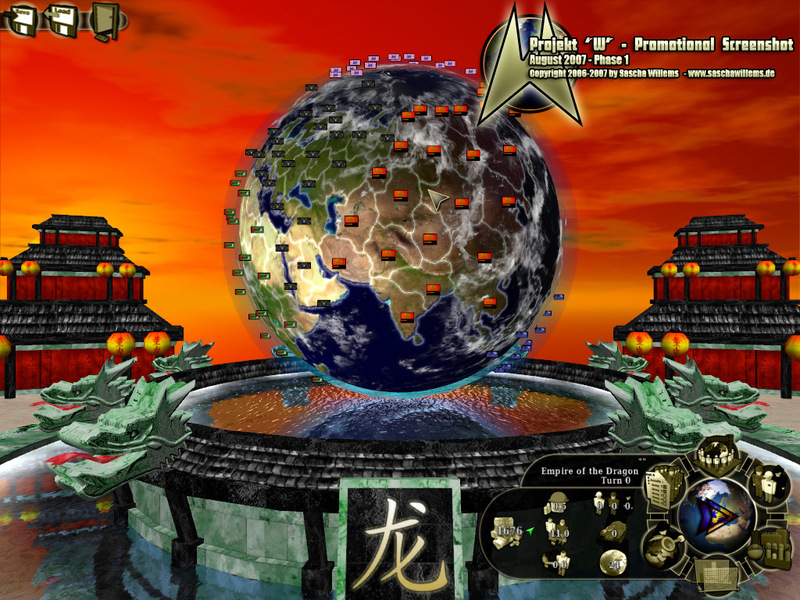 The time a player can spend on his turn is limited in this mode. The usual eye-candy. These shots were taken with all details enabled, using shaders and 4xanti-aliasing. Click on a shot to magnify it.